This post is the 4th in a series on serverless computing (see Part 1, Part 2, and Part 3) and will focus on the differences between serverless architectures and the more widely known Platform-as-a-Service (PaaS) and Extract-Transform-Load (ETL) architectures. 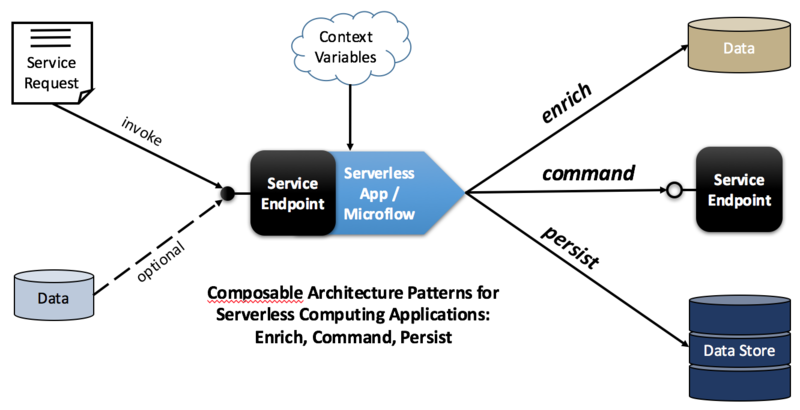 If you are unsure about what is serverless computing, I strongly encourage you to go back to the earlier parts of the series to learn about the definition and to review concrete examples of microflows, which are applications based on serverless architecture. This post will also use the applications developed previously to illustrate a number of serverless architecture patterns. Serverless and cloud. At a surface, the promise of serverless computing sounds similar to the original promise of cloud computing, namely helping developers to abstract away from servers, focus on writing code, avoid issues related to under/over provisioning of capacity, operating system patches, and so on. So what's new in serverless computing? To answer this question, it is important to remember that cloud computing defines three service models: Infrastructure-as-a-Service (IaaS), Platform-as-a-Service (PaaS), and Software-as-a-Service (SaaS). Since serverless fits the definition of a PaaS, it offers many of the same benefits. However, unlike Cloud Foundry, OpenShift, Heroku, and other traditional PaaSes focused on supporting long running applications and services, serverless frameworks offer a new kind of a platform for running short lived processes and functions, also called microflows. The distinction between the long running processes and microflows is subtle but important. When started, long running processes wait for an input, execute some code when an input is received, and then continue waiting. In contrast, microflows are started once an input is received, execute some code, and are terminated by the platform after the code in the microflow finishes executing. One way to describe microflows is to say that they are reactive, in the sense that they react to incoming requests and release resources after finishing work. Serverless and microservices. Today, an increasing number of cloud based applications that are built to run on PaaSes follow a cloud native, microservices architecture. Unlike microflows, microservices are long running processes designed to continuously require server capacity (see microservices deployment patterns) while waiting for a request. For example, a microservice deployed to a container based PaaS (e.g. Cloud Foundry) consumes memory and some fraction of the CPU even when not servicing requests. In most public cloud PaaSes, this continuous claim on CPU and memory resources directly translates to account charges. Further, microservices implementations may have memory leak bugs that result in increasing memory usage depending on how long a microservice has been running and how many requests it serviced. In contrast, microflows are designed to be launched on demand, upon the arrival of a specific type of a request to the PaaS hosting the microflow. After the code in the microflow finishes executing, the PaaS is responsible for releasing any resources allocated to the microflow during runtime, including memory. Although in practice the hosting PaaS may not fully release its memory resources to preserve a reusable, "hot" copy of a microflow for better performance, the PaaS can prevent runaway memory leaks by monitoring its memory usage and restarting the microflow. Microflows naturally compliment microservices by providing means for microservices to communicate asynchronously as well as to execute one-off tasks, batch jobs, and other operations described later in this post based on serverless architecture patterns. Serverless and ETL. Some may argue that serverless architecture is a new buzzword for the well known Extract Transform Load (ETL) technologies. The two are related, in fact, AWS advertises its serverless computing service, Lambda, as a solution for ETL-type of problems. However, unlike microflows, ETL applications are implicitly about data: they focus on a variety of data specific tasks, like import, filtering, sorting, transformations, and persistence. Serverless applications are broader in scope: they can extract, transform, and load data (see Part 3), but they are not limited to these operations. In practice, microflows (serverless applications), are as much about data operations as they are about calling services to execute operations like sending a text message (see Part 1 and Part 2) or changing temperature on an Internet-of-Things enabled thermostat. In short, serverless architecture patterns are not the same as ETL patterns. The following is a non-exhaustive and a non-mutually exclusive list of serverless computing patterns. The patterns are composable, in the sense that a serverless application may implement just one of the patterns, as in the examples in Part 1 and Part 2, or alternatively an application may be based on any number of the patterns, as in the example in Part 3. The command pattern describes serverless computing applications designed to orchestrate service requests to one or more services. The requests, which may be handled by microservices, can target a spectrum ranging from business services that can send text messages to customers to application services, such as those that handle webhook calls, and to infrastructure services, for example those responsible for provisioning additional virtual servers to deploy an application. The persist pattern describes applications that more closely resemble the traditional ETL apps than is the case with the other two patterns. When a microflow is based solely on this pattern, the application acts as an adapter or a router, transforming input data arriving to the microflow's service endpoint into records in one or more external data stores, which can be relational databases, NoSQL databases, or distributed in-memory caches. However, as illustrated by the example in Part 3, applications use this pattern in conjuction with other patterns, processing input data through enrich or command patterns, and then persisting the data to a data store. Until recently, platform as a service (PaaS) clouds offered competing approaches on how to implement traditional Extract Transform Load (ETL) style workloads in cloud computing environments. Vendors like IBM, AWS, Google, are starting support serverless computing in their clouds as a way to support ETL and other stateless, task-oriented applications. Building on the examples from Part 1 and Part 2 which described serverless applications for sending text messages, this post demonstrates how an OpenWhisk action can be used to validate unstructured data, add value to the data using 3rd party services / APIs, and to persist the resulting higher value data in an IBM Compose managed database server. The stateless, serverless action executed by OpenWhisk is implemented as a Node.JS app, packaged in a Docker container. NOTE: before proceeding, configure the following environment variables from your command line. Use the Docker Hub username for the USERNAME variable and the Pitney Bowes application ID for the PBAPPID variable. When signing up for a Compose trial, make sure that you choose Postgres as your managed database. Once you are done with the Compose sign up process and your Postgres database deployment is completed, open the deployments tab of the Compose portal and click on the link for your Postgres instance. You may already have a default database called compose in the deployment. To check that this database exists, click on a sub-tab called Browser and verify that there is a link to a database called compose. If the database does not exist, you can create one using a corresponding button on the right. Next, open the database by clicking on the compose database link and choose the sub-tab named SQL. At the bottom of the SQL textbox add the following CREATE TABLE statement and click the Run button. The output at the bottom of the screen should contain a "Command executed successfully" response. You also need to export the connection string for your database as an enviroment variable. Open the Deployments tab, the Overview sub-tab, and copy the entire connection string with the credentials included. You can reveal the credentials by clicking on the Show / Change link next to the password. Insert the full connection string between the single quotes below and execute the command. NOTE: This connection string will be needed at a later step when configuring your OpenWhisk action. to authenticate with IBM Bluemix and then enter your Bluemix email, password, as well as the deployment organization and space as prompted. The first command creates a new Cloudant deployment in your IBM Bluemix account, the second assigns a set of credentials for your account to the Cloudant deployment. The third command should output a JSON document similar to the following. You will need to put these Cloudant credentials in environment variables to create a database and populate the database with documents. Insert the values from the returned JSON document in the corresponding environment variables in the code snippet below. This will create a compose-postgres-openwhisk folder in your current working directory. Most of the code behind the action is in the server/service.js file in the functions listed below. As evident from the function names, once the action is triggered with a JSON object containing address data, the process is to first query the Pitney Bowes geolocation data to validate the address and to obtain the latitude and the longitude geolocation coordinates. Next, the process retrieves a connection to the Compose Postgres database, runs a SQL insert statement to put the address along with the coordinates into the database, and returns the connection back to the connection pool. The code to integrate with the OpenWhisk platform is in the server/app.js file. Once executed, the code starts a server on port 8080 and listens for HTTP POST requests to the server's _init_ and _run_ endpoints. Each of these endpoints delegates to the corresponding method implementation in server/service.js. The init method simply logs its invocation and returns an HTTP 200 status code as expected by the OpenWhisk platform. The run method executes the process described above to query for geocoordinates and to insert the retrieved data to Compose Postgres. If you don't have Docker installed, it is available per the instructions provided in the link below. Note that if you are using Windows or OSX, you will want to install Docker Toolbox. You will be prompted and will need to enter your Docker Hub password. Change to the compose-postgres-openwhisk as your working directory and execute the following commands to build the Docker image with the Node.JS based action implementation and to push the image to Docker Hub. docker build -t $USERNAME/compose . Use your browser to login to https://hub.docker.com after the docker push command is done. You should be able to see the compose image in the list of your Docker Hub images. If your $ORG and $SPACE environment variables are not set, refer back to the section on creating a Cloudant database. The following commands need to be executed to configure your OpenWhisk instance to run the action in case if a new document is placed in the Cloudant database. The first command sets up a Docker-based OpenWhisk action called composeInsertAction that is implemented using the $USERNAME/compose image from Docker Hub. wsk action update composeInsertAction --param connString "$CONNSTRING" --param pbAppId "$PBAPPID"
Use IBM Bluemix, NoSQL Cloudant, OpenWhisk, Docker, and Twilio to Send text messages based on a Cloudant feed. This post is a Part 2 in a series on serverless computing. The last post described how to build a simple but useful text messaging application written in Python, packaged in a Docker image on Docker Hub, and launched using the OpenWhisk serverless computing framework. The app was implemented to be entirely stateless, which is common in serverless computing but can be limiting for many practical use cases. For example, applications that send text messages may need to make a record about the text message contents, the date and time when the message was sent, and other useful state information. This post will describe how to extend the application built in Part 1 to persist the text message metadata in Cloudant, a PouchDB based JSON document database available from IBM Bluemix. 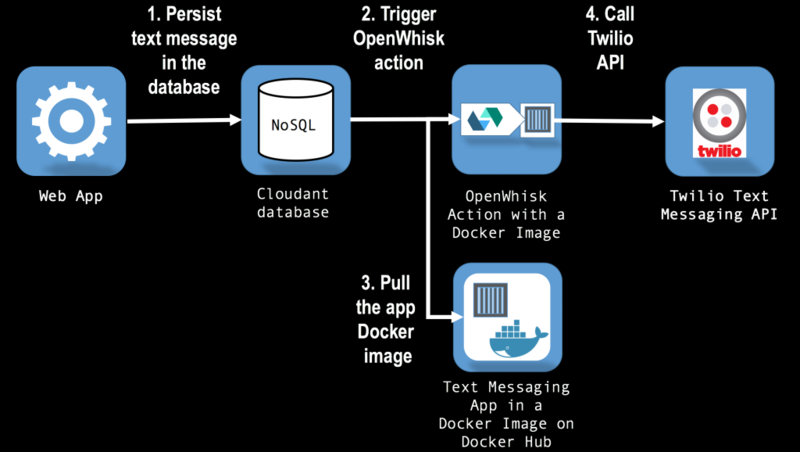 Since OpenWhisk integrates with Cloudant, it is possible to setup OpenWhisk to automatically trigger a Docker-based action to send the SMS once the text message contents are in Cloudant. An overview of the process is described in the following diagram. If your $ORG and $SPACE environment variables are not set, refer back to the section on creating the Cloudant database. Run following commands to configure OpenWhisk to start the action in case if a new document is placed in the Cloudant sms database. The first command creates a trigger that listens to changes to the Cloudant database. The second command is a rule that indicates that whenever the trigger is activated with a document in Cloudant, then the text messaging action (textAction created in the previous post) needs to be invoked. Once Forbes starts to cover serverless computing you know that it is time to begin paying attention. Today, there are many frameworks that can help you get started with serverless computing, for example OpenWhisk, AWS Lambda, and Google Cloud Functions. 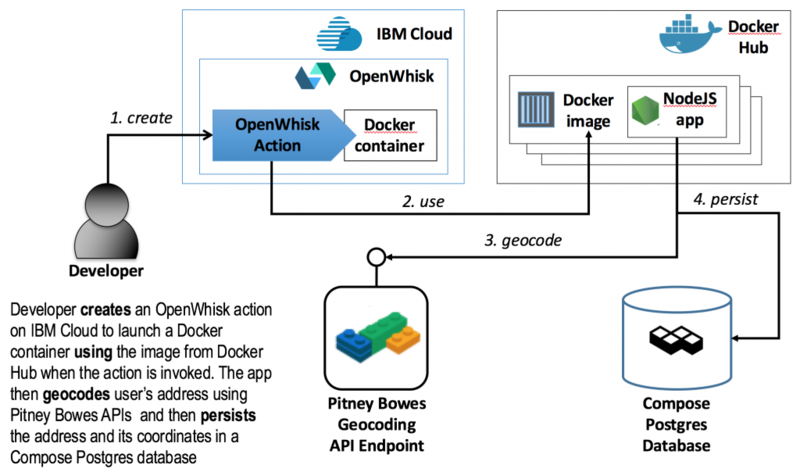 This post will help you build a simple but useful serverless computing application with OpenWhisk on IBM Cloud. The app is implemented using Python with Flask and can help you send text messages via a Twilio SMS API. If you would like to skip the introductions and geek out with the code, you can access it from the following github repository: https://github.com/osipov/openwhisk-python-twilio Otherwise, read on. OpenWhisk's use of Docker means that any server side programming language supported by Docker can be used for serverless computing. This is particularly important for organizations that target hybrid clouds, environments where legacy, on-premise code needs to be integrated with code running in the cloud. Also, since Docker is a de facto standard for containerizing applications, serverless computing developers don't need to learn yet another packaging mechanism to build applications on IBM Cloud. You can use the sample app described in this post to figure out whether OpenWhisk works for you. The post will walk you through the steps to clone existing Python code and package it as a Docker image. Once the image is in Docker Hub, you will create an OpenWhisk action that knows how to launch a Docker container with your code. To send a text message, you will use OpenWhisk's command line interface to pass it the text message contents. 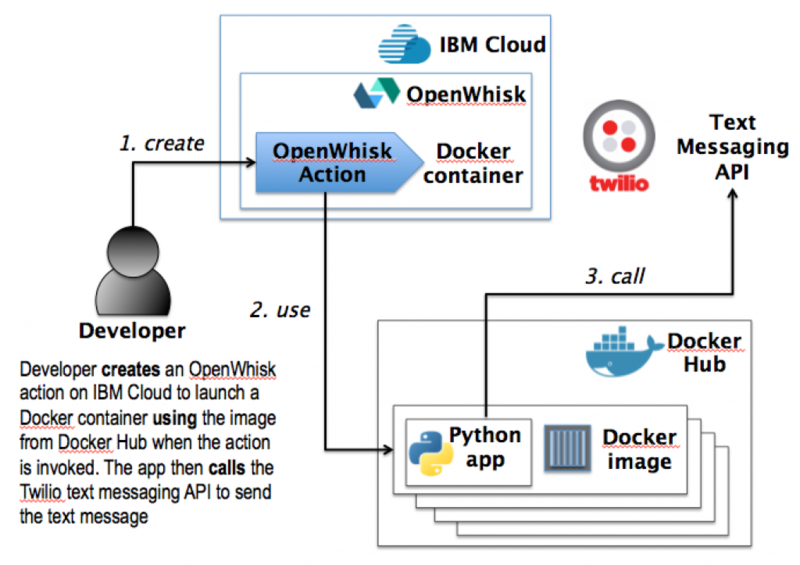 In response, OpenWhisk instantiates the Docker container holding the Python app which connects to Twilio's text messaging service and sends an SMS. This app uses Twilio for text messaging capabilities. To sign up for a Twilio account visit: https://www.twilio.com/try-twilio Make sure that once you have a Twilio account, you also obtain the account SID, authentication token, and register a phone number with an SMS capability. This will create an openwhisk-python-twilio folder in your current working directory. All of the code for the OpenWhisk action is in the py/service.py file. There are two functions, called init and run that correspond to Flask app routes /init and /run. The init function is called on an HTTP POST request and returns an HTTP 200 status code as expected by the OpenWhisk platform. The run function verifies that an incoming HTTP POST request is a JSON document containing Twilio configuration parameters and the content of the text message. After configuring a Twilio client and sending the text message, the function returns back an HTTP 200 status code and a JSON document with a success status message. You will be prompted to enter your Docker Hub password. Run the following commands to build the Docker image with the OpenWhisk action implementation and to push the image to Docker Hub. docker build -t $DOCKER_USER/openwhisk . Use your browser to login to https://hub.docker.com after the docker push command is done. You should be able to see the openwhisk image in the list of your Docker Hub images. wsk action update textAction --param account_sid "$TWILIO_SID" --param auth_token "$TWILIO_TOKEN"
The first command sets up a Docker-based OpenWhisk action called textAction that is implemented using the $DOCKER_USER/openwhisk image from Docker Hub. The second command configures the textAction with the Twilio account SID and authentication token so that they don't need to be passed to the action execution environment on every action invocation. to monitor the result of running the OpenWhisk action. 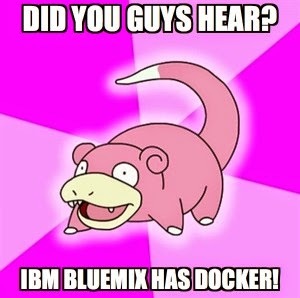 Roughly a week ago IBM announced a new Docker-based service as part of Bluemix PaaS. It is still early but the service looks very promising, especially for I/O heavy workloads like databases and analytics. This post will help you create your own container instance running on Bluemix and provide some pointers on how you can evaluate whether the I/O performance of the instances matches your application’s needs. It will also describe nuances of using boot2docker if you are running Mac OSX or Windows. Even if you are not familiar with Docker, chances are you know about virtual machines. When you order a server hosted in a cloud, in most cases you get a virtual machine instance (a guest) running on a physical server (a host) in your cloud provider’s data center. There are many advantages in getting a virtual machine (as opposed to a physical server) from a cloud provider and arguably the top one is quicker delivery. Getting access to a physical server hosted in a data center usually takes hours while you can get a virtual machine in a matter of minutes. However, many workloads like databases and analytics engines are still running on physical servers because virtual machine hypervisors introduce a non-trivial penalty on I/O operations in guest instances. Enter Linux Containers(LXC) and Docker. Instead of virtualizing the hardware (as the case with traditional virtual machines) containers virtualize the operating system. Start up time for containers is as good or better (think seconds not minutes) than for virtual machines and the I/O overhead all but disappears. In addition, Docker makes it easier to manage both containers and their contents. Containers are not a panacea and there are situations where virtual machines make more sense but that’s a topic for another post. In this post, you can follow along with the examples to learn whether I/O performance of Docker containers in IBM Bluemix matches your application’s needs. 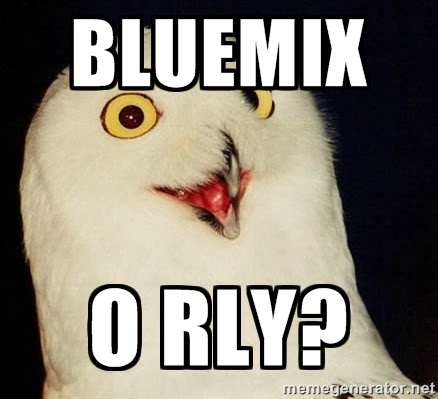 Before starting, make sure that you have access to Bluemix and to the Container Service. In short, once you have provisioned an instance of the Container Service, you should have received an email notifying you that you have been approved for access and you should be able to see an API key as described in the example here. The instructions below describe how to use boot2docker for access to a Docker installation. boot2docker deploys a VirtualBox guest with Tiny Core Linux to OSX and you’ll ssh into this guest to access docker CLI. The same approach should also work on Windows although I am yet to try it. Install python and the ice tool in your boot2docker guest to interface to the IBM Container Environment. The approach used in these steps to install python is specific to TinyCore Linux and shouldn’t be used on other distros. ssh-keygen -t rsa -C "<your_email@example.com>"
Make sure that you have provisioned an instance of the Container Service in Bluemix and copy/paste the API key into the command below. Details on how to obtain the API key are here. Also make sure that you note the registry key you specified when provisioning the Containers service. You’ll need it later in the instructions. The login command should complete with a Login Succeeded message. Once the image completed downloading, you will create a Dockerfile that will customize the image with your newly created credentials (so you can ssh into it) and with sysbench scripts for performance testing. ice --local build -t example/sysbench . which should finish with a Successfully built message followed by an ID. When you got access to the Container Service, you should have noticed a registry URL which is shown right above your API key. For an example, see here. The registry URL should end with a postfix which you specified when provisioning the Containers service . In the commands below, replace <registry_id> to ensure you are specifying your registry URL. Request a public IP address from the Container Service and note its value. Benchmarks are an artificial way of measuring performance and better benchmark results don’t always mean that your application will necessarily run better or faster. However, benchmarks help understand if there exists potential for better performance and help you design or redesign your code accordingly. In case of the Containers Service on IBM Bluemix, I/O benchmark performance results are significantly superior to those from a Softlayer virtual machine. This shouldn’t be surprising since Containers runs on bare metal Softlayer servers. However, unlike the hardware servers, Containers can be delivered to you in seconds compared to hours for bare metal. This level of responsiveness and workload flexibility enable Bluemix application designers to create exciting web applications built on novel and dynamic architectures.